Some 30 percent of NFL fans say they’re watching less, according to a new survey. 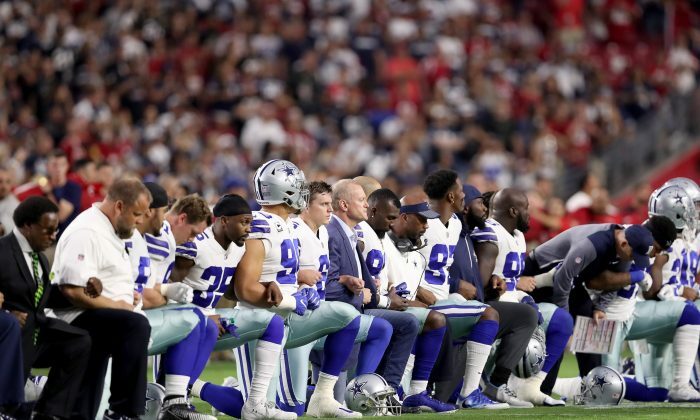 Half of those self-described “fans of the NFL” said that they’re watching less because of players protesting during the national anthem, according to the Seton Hall Sports Poll, conducted by The Sharkey Institute. Some 52 percent said that they disagreed with the protests, according to the New York Post. Six percent said they’re boycotting the games in solidarity with kneeling players. President Donald Trump last month tweeted and commented on the protests, saying that those players who protest should be fired. That following Sunday, at least 200 players around the league protested during the anthem. About 38 percent of fans said they actually support players who are taking a knee. Among NFL fans, only 1 percent said that they’re watching fewer games because they’re angry about the increase in reports on dangers of head injuries that some players face. The Sharkey Institute polled 845 U.S. adults between Sept. 25 and 27, with an estimated margin of error of 3.8 percentage points. The NFL’s Week 4 saw yet another ratings decline, according to the Nielsen company, amid calls from fans and conservatives to boycott the league over player’s anthem protests. The fourth week had the smallest audience of the season so far, the firm said on Tuesday. The nationally televised games averaged 14.2 million viewers—down from 14.8 million viewers for Week 3, The Associated Press reported. The first NFL player to kneel during the national anthem was Colin Kaepernick, who said he did it to protest police brutality and racial injustice. Kaepernick drew the national spotlight with his protest, but has not been hired by any team since becoming a free agent.